Fussy rainbow trout in wonderfully rich, small, angling lakes are the hallmarks of the Thompson-Nicola. The region provides some of the best small-lake angling in the world. For the angler who ventures unprepared these waters can also provide some of the world's most frustrating angling. 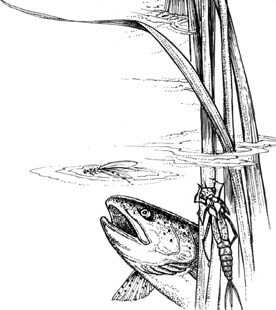 Large, well-fed trout in rich waters are rarely easy fish. The Kamloops trout in particular is notorious for keying to specific foods at specific times. With few exceptions these food items are aquatic insects. The angler who knows the seasonal patterns of these insects and has a working knowledge of their habits is well on the way to consistent success. The brief sketches of the major aquatic insects provided in the following pages provide that knowledge in a handy reference format.